Nuvo Adjustable Step Reduces The Height Of Step. Ideal for use at the side of the bath or shower cubicle to reduce the height of the step in. 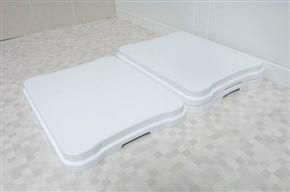 Can also be used in conjunction with a bath board to aid lifting legs over the side. Flexibility - The versatile Nuvo Adjustable Bath Step consists of three stacking 2" step sections with 1" overlap and four support pillars. When stacked together the step sections give a 4" step. Use a single step section with a minimum of two support pillars for a 2" step, add a second step section for a 3" step, or use with all three sections stacked as the 4 " step. You can also place two of the support pillars in each of two steps, which can be linked together laterally, and the third step placed on top of one of these to give a 2" and 3" combined step. Step sections can be stacked up to 6 high (two Nuvo Adjustable Bath Steps would need to be purchased for this) to give a 7" maximum raise. Security - Each Bath Step section has non-slip feet, so the Bath Step remains secure on a wide range of bathroom floor surfaces. The top surface of each step has a specially designed surface texture that is both comfortable on the feet, but also provides excellent resistance to slipping, even when the client has wet feet. 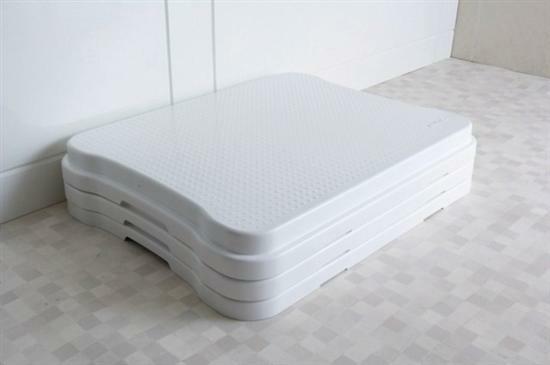 The support pillars provide additional strength and support to the Bath Step, giving greater confidence to the user when standing on the step. A recess, on the side of each section, allow the step to be picked up easily from the floor when required. Style - Attractive styling and a bright white finish, enable the Bath Step to complement a wide range of bathroom colour schemes and styles. Colour co-ordinated to other bathroom products in the Nuvo range. Manufactured in polypropylene. Can be cleaned by wiping with mild disinfectant or autoclaved at cycles up to 80°C.